Skiathos is the first island we meet. The most cosmopolitan. 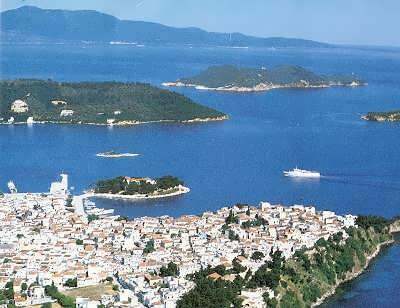 Chora (Skiathos Town) is the capital of Skiathos and has a population of 6,000. It is built on the site of ancient Skiathos at the foothills and slope of a small hill. 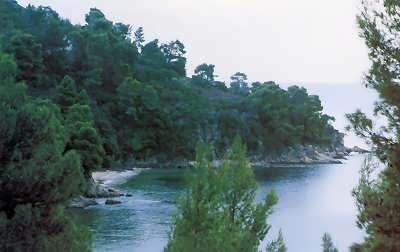 The island is emerald green, filled with plane, pine and fir trees, as well as fruit-bearing trees and vineyards. 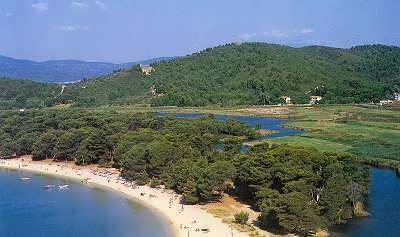 Skiathos has an excellently developed infrastructure for tourism, which combines all kinds of holidays. It also has wonderful beaches and an excellent climate. Every summer, Skiathos becomes extremely cosmopolitan, from the influx of a great number of tourists. Freshly - painted island homes, traditional architecture, and superb cobblestone roads are the décor of summertime Skiathos. 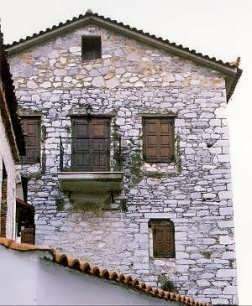 At the famous Greek school of Skiathos, which was founded during Kapodistrias’ Governance (the first Greek Governor following the revolution against Turkish rule in 1821), many famous writers were students there, such as Alexander Papadiamandis, Stefanos Dimitriadis, Eugenios Dimitriadis and Moraitis. Bourtzi. It is located at the port and is a Venetian fortress built in 1206. Koukounaries. 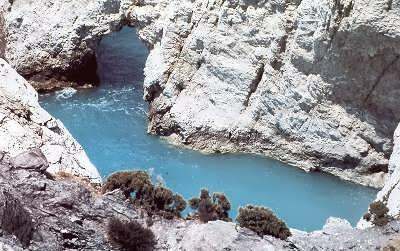 At a distance of 13 km from Chora (Skiathos Town). It is a forest of pine-cones which ends up at a beautiful beach with golden sand. 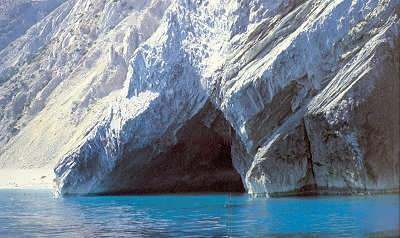 It is one of the most beautiful natural beaches of the Mediterranean. The house of Alexandros Moraitis. The Monastery of Agios Charalambos. 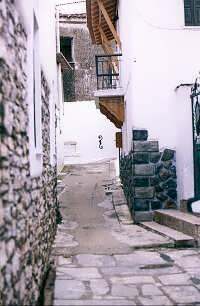 The Monastery of Panagias Kounistras. The Lake. It is exactly behind Koukounaries, and is an important wetlands of the area.